Phoebe English is a storyteller. 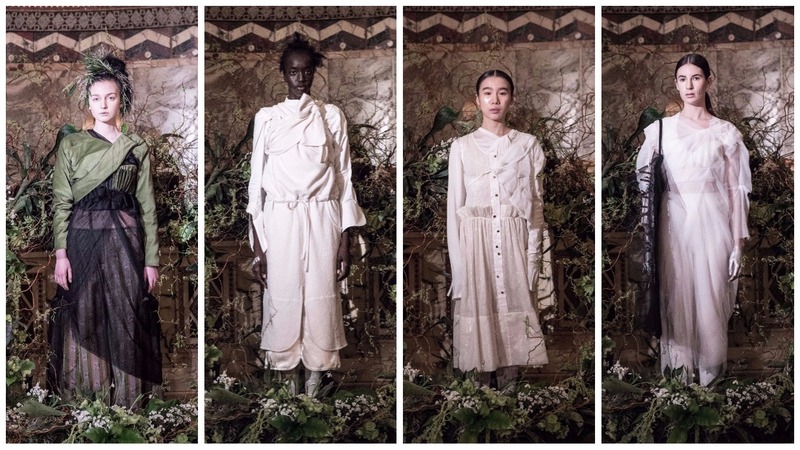 She not only operates in the realm of fashion design but she heightens her approach to craft with a penchant for dissecting contemporary culture, the politics of today with richness and focus. ‘Focus’ is the operative word when analysing English’s work. Her previous womenswear collection explored the days before and immediately after Britain’s referendum on European Union membership, the aftershock of which still reverberates around the continent, plaguing us with uncertainty. 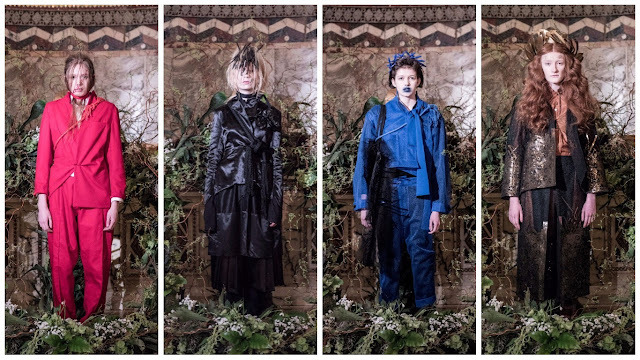 For Fall 2017, English decided to follow the same outline as last season where she contemplated the times through seven characters; here, it was eight emotions applied to eight looks. Tyranny, Fear, Apathy, Voice, Courage, Unity, Repair, Hope. The linear structure of emotionality highlighted her acuity and presented seemingly disjointed concepts in a digestible fashion. Without this structure, there would’ve been a boneless collection without direction—certainly, it would reflect the havoc we’ve engendered as a species but it would defeat the purpose of English’s storytelling. This is a story, an unfinished, unresolved manuscript. There is no end in sight but we must latch onto Voice, Courage, Unity, Repair, Hope. It was as much a fashion show as it was a story, and as much a story as it was a manifesto. Her modern manifesto was portrayed in a limited colour palette comprising of lustrous bronze, wood green, off-white, black, grey, crimson and cobalt. Attaching colour to emotions, a synesthete’s conclusion. Tyranny was red—a symbol of aggression, anger, war. Fear was rendered in black satin, the model’s hair was decorated with black daggers. Apathy, typically, came in a dull hue of pewter; it’s silhouette was slouchy, disinterest personified—the laziness of the shaping reminded one of English’s insistence against passivity, it being a luxury we can no longer afford. Courage was bronze; the model’s crown was adorned with a marvellously grand headpiece signifying confidence, strength and power. Hope was green, the model standing in a flowery mise-en-scène became part of the set design in a compelling fashion. Voice, Unity, Repair were delivered in various shades of white—doubled-faced mesh, gossamer and silver accents were combined to create a poetically beautiful conclusion. The political, the personal intersect in Phoebe English collections. Their interconnectedness is spotlighted by the way our emotions are linked to our politics. Tyranny, fear, apathy, voice, courage, unity, repair, hope are emotions, possessions and in the context of politics they are omnipresent. More and more, one finds themselves drawn into the heartbreakingly honest world of Phoebe English, her organic design process and her emphasis on craft.